Work to deliver one of the most challenging sections of the Borders Railway at Falahill will get under way next week as the project continues its focus on the development of key railway structures. 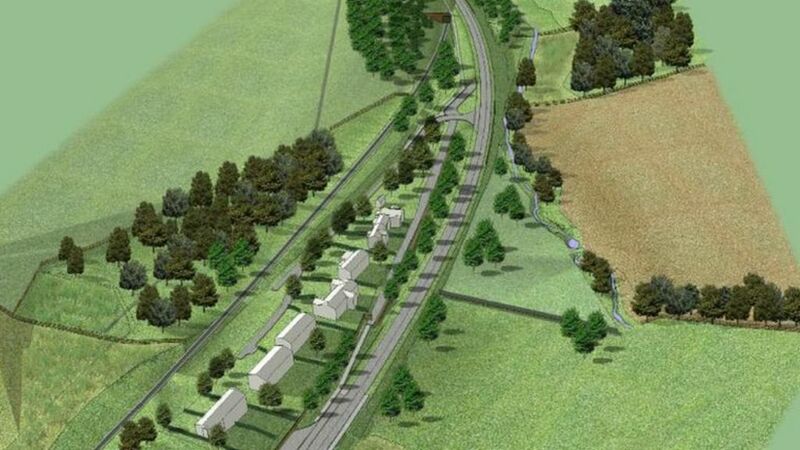 The design, approved by Scottish Borders Council in November, moves the A7 slightly to the west of its current alignment, giving more room between the road and the Falahill cottages. It also sees a new bridge built to the south of the properties, carrying the road over the railway. The bridge is the third and final A7 crossing to start work and will take the Borders Railway one step closer to bringing train services back to Midlothian and the Scottish Borders for the first time in over 40 years. Network Rail says traffic should be able to "flow freely" during construction of a final bridge over the A7 as part of the Borders Railway works. The Borders Railway project team is celebrating after receiving an excellent CEEQUAL award rating in recognition of its environmental design credentials. Looking north over the A7 at Falahill in February 2013 towards the Waverley Route trackbed on the right. Some re-routing of the road will be necessary to provide a bridge over the new railway. A class 08 hauled track recovery train rumbles north in rapidly fading light towards Falahill Summit in this rare January 1972 view, photographed during the penultimate phase of track lifting along the Waverley Route.